The Kyngdoms began life in early 2003. It was originally intended to be part of a fantasy fanzine website, with interviews, articles, reviews and so forth, plus a fantasy setting that would be updated on a weekly or monthly basis. As the setting grew, however, the idea for the fanzine faded and it soon became clear that The Kyngdoms had taken on a life of its own. 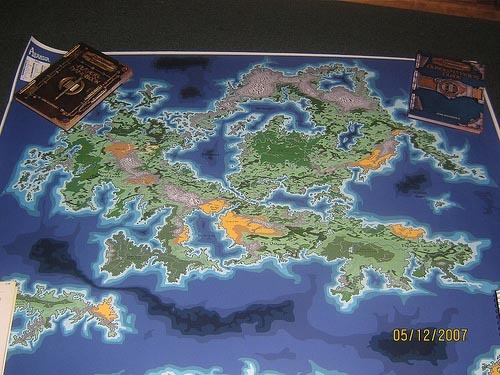 With the release of the 3rd edition of the fantasy role playing game Dungeons and Dragons, The Kyngdoms was released in April 2005 under the Open Game License (OGL) and included stats and details for that game. After several years of moderate success, The Kyngdoms was thoroughly revamped in 2012. 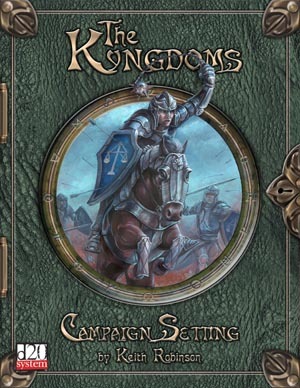 All the gaming content was removed and The Kyngdoms became a standalone fantasy setting. From that simple start nations started to grow and ideas were formed. A small pack consisting of around 30 pages was created and contained everything there was. This was the very beginning of The Kyngdoms and much of what was contained in that pack went on to form The Kyngdoms as we know it today. Slowly more was added and nations emerged with their own histories and cultures, Gods rose to power and a new and bigger map emerged - someone was even crazy enough to publish it! Over the course of the next couple of years every section of The Kyngdoms grew. The detail and story weaving of the nations and their histories, as well with the history of the world itself, really brought the setting to life and helped set it apart from the vast majority of online settings that existed at that time (and that exist today). Everything was linked and interwoven, giving The Kyngdoms a rare depth and flavor that was both captivating and enthralling. In all it took over 2 years to complete and the website was launched on 18th April 2005. A book and PDF had been released a couple of days earlier on the 15th April. It was released as a game accessory for the 3.5 edition of Dungeons & Dragons under the OGL, a license released by Wizards of the Coast to encourage third party publishers to produce material for their game. It was released to some acclaim and has been online ever since. In 2009, a decision was taken to revamp The Kyngdoms and though much was done, it wasn't until 2012 that work began in earnest as a new direction for the setting was set upon. It was decided to remove all specific gaming content and leave the setting as flavor only, for use for in gaming, reading and general interest. The history of the setting was updated and many changes were made. The website also underwent a radical and complete overhaul and was eventually ready for a new launch in 2013.